An embedded system is a computer system designed to perform one or a few dedicated functions , often with real-time computing constraints. It is embedded as part of a complete device often including hardware and mechanical parts. In contrast, a general-purpose computer, such as a personal computer, is designed to be flexible and to meet a wide range of an end-user's needs. Embedded systems control many of the common devices in use today . Embedded systems are controlled by a main processing core that is typically either a microcontroller or a digital signal processor (DSP). Since the embedded system is dedicated to specific tasks, design engineers can optimize it reducing the size and cost of the product and increasing the reliability and performance. Some embedded systems are mass-produced, benefiting from economies of scale. Physically, embedded systems range from portable devices such as digital watches and MP3 players, to large stationary installations like traffic lights, factory controllers, or the systems controlling nuclear power plants. 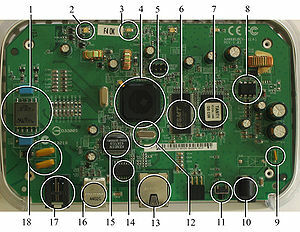 Complexity varies from low, with a single microcontroller chip, to very high with multiple units, peripherals and networks mounted inside a large chassis or enclosure. In general, "embedded system" is not an exactly defined term, as many systems have some element of programmability. For example, handheld computers share some elements with embedded systems such as the operating systems and microprocessors which power them, but are not truly embedded systems, because they allow different applications to be loaded and peripherals to be connected.